MagLite® M3A Flashlight with your Company Logo! The popular Mini Mag-Lite with two AAA batteries and a sleek presentation box. 4 colors available. Laser engraved with your company logo. 5" length. 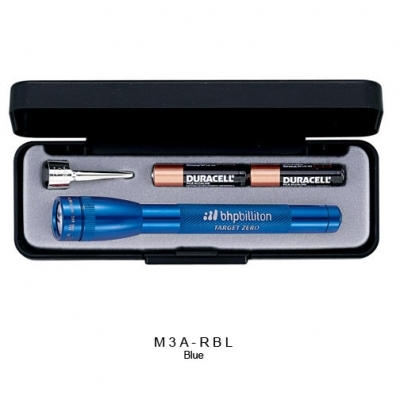 Comes with 2"AAA" batteries and packaged in a sleek presentation gift box. This “AAA” Mini Mag-Lite® is slightly smaller, thinner version of the M2A "AA" Mini Mag-Lite®. • Has a high-intensity adjustable light beam that goes from spot to flood, and is water & shock resistant. • Great for engineers, technicians, physicians, HVAC, automotive repairmen, inspectors, and other repair people. Handy pocket clip for your mobile customers. Color: Shown in the pull-down menu. Price includes your imprint laser engraved on the flashlight, one location. Optional 2nd Location Engraving $0.90 (g) each plus set-up charge. Packed 72 per box, 25 lbs.